Can a character be understood in a more refined way? What does an anime about a bunch of gemstones and a film franchise about a box of playthings have in common? If you said, “They both feature talking inanimate objects,” you’d be correct. If you said, “They both are really awesome projects,” you’d be correct as well. And if you said, “They both represent landmarks in the CG space within their respective mediums,” well, guess what? You’d be correct once again. 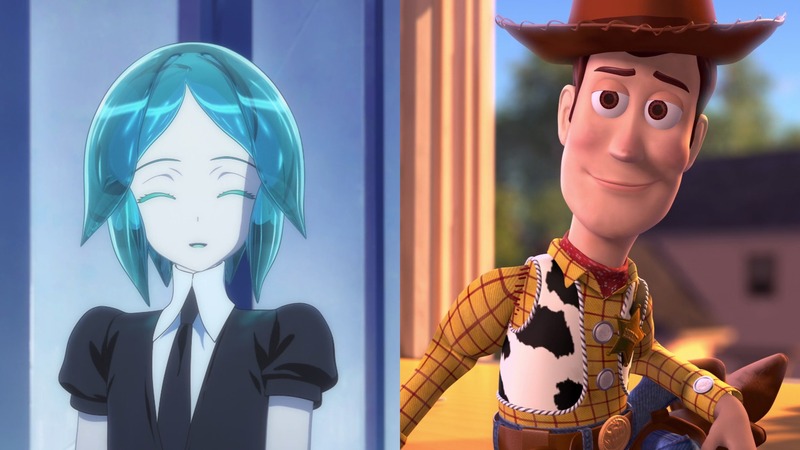 There’s at least one more major commonality between them: Houseki no Kuni and Toy Story each host a diverse cast of characters who build their tales into how we view them today. So, having recently finished the former and having always being a big fan of the latter, a question arose in my brain: What really does go into making a character? This essay will take a look-see into characters. How they are defined, what impact they contain, and why understanding the distinctions among them is worthwhile. Furthermore, for comparative purposes, relevant examples from Houseki no Kuni and Toy Story (what with its fourth iteration on the way) will attempt to illustrate the topics at hand. Hopefully, the approach and the examples will make it easier to grasp these concepts while also adding in a bit of extra fun. If nothing else, it should serve as a primer for those new to these points and a refresher for those who already have a knack for them.